If the President knows the rules of board shorts….shouldn’t you? You know that feeling you get when people compliment the cool car you drive, or your hair cut, or maybe you’re really good at going to the gym and working on your physique, and people always notice that six-pack you strive oh-so hard for? No? Ok, how about that feeling you get when you rattle off sports statistics and serious insight into how your favorite college football teams are going to do this season, or maybe you don’t receive validation through any of those ways. Maybe you receive it from your insight into political or economic wisdom? This is what happens when you spend your life looking at the bottom of the pool. I can’t tell you how many times I’ve seen someone from the Midwest meet me at the beach for volleyball and they take off their shirt to reveal a worn pair of Hanes tighty whities poking out the top of their trunks. Board shorts are made to be worn commando. Don’t believe me? Then believe the thousands of surfers and beach dwellers who live near the beach, not you Mr. “I just got off the plane from Missouri” and only go to the beach once every other year, but I know better. Still don’t believe me? Then believe the hundreds of local California girls who are laughing behind your back about it. Even if you think you’re cool in your black Calvin Klein boxer briefs, you’re not. Save those for when you’re wearing jeans or shorts. Now if you’re one of those guys who can’t run commando in trunks because your junk gets in the way, well then fine, buy a pair of trunks that have the built-in underwear for support. Notice those built-in underwear don’t peak out the top of the shorts like a diaper. 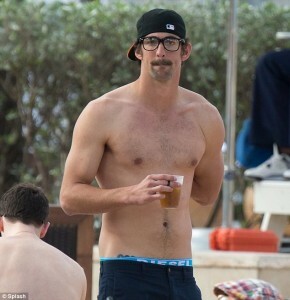 Or if you must, wear a speedo underneath your board shorts. Why you ask? Cause it looks cheap, and it looks like you bought them at Old Navy, and it looks like you must fluctuate in body size if you need a pair than can grow and retract with your ballooning weight size. Harsh? Yes, but being dressing cool and hip isn’t child’s play. So why wear the same expandable elastic bathing suit your 6-year-old nephew wears? When it comes to size (how high above or below your shorts should end) or color and pattern, almost anything is game. Men’s swimwear is one of those rare clothing items where even if you normally dress conservatively, you can actually wear something a little loud, or obnoxious, flamboyant or funny because you’re at the beach, or a pool, and life isn’t meant to be taken so seriously in these moments. I buy 1-2 new board shorts every Spring, partly because I’m a bit of a clothes whore (ok, a lot a bit) but also because I like having new options each summer and am usually bored of last year’s pair by then. This is a practical tip, not just a style tip. Board short rash anyone? Even if you’re in a beach town, you take a few minutes and go home to change before hitting the pier for the night. You think a girl is gonna want to talk to you after you’ve been free balling for 12 hours? Pack a bag with some extra shorts or jeans before you head out to the lake or your pool party. No one wants to catch a whiff of your all day ball stink when they go out at night. You can tell me how to workout, what teams I should root for, who to vote for, what to eat, and which music I should download, but when it comes to style, listen up. These are 3 easy rules for board shorts. I’m writing this now to make sure the beach isn’t destroyed from your poor choices next summer. BOTTOM LINE: DO NOT WEAR UNDERWEAR UNDER YOUR BOARD SHORTS, DON’T BUY BOARD SHORTS WITH ELASTIC WAIST BANDS, AND WHEN THE SUN GOES DOWN IT’S TIME TO CHANGE. For part 1 on the rules of denim, click here. Ryan Daly is a Hollywood manager and film/TV producer who works in entertainment and fashion. Now, I’d like to see a blog post about socks. I see so many offenders. I think it’s time we address this. Will, you have the best sock collection in LA. You are the man for the job! do you surf? 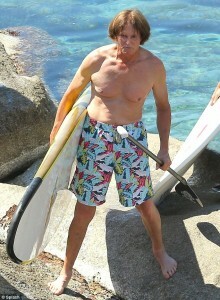 if you are surfing in warm water (no wetsuit) you have to have something under those board shorts! Thanks for visiting and commenting Ben. The author is adamant you don’t need ’em, but please share with us otherwise! Hey guys, just wanna say that I come from the Philippines and there’s nothing better than surfing commando. Yeah it might be fun until a hungry shark thinks your junk looks like a large worm or small eel.. I agree, it may become a hard situation if you don’t. Have you seen the board short liners from Original Waterman? My boys love them. They wear them under the board shorts. They claim they don’t get rashes any more, they help keep them warm and they fit great under their wet suits. My oldest son claims they don’t ride up. The designs are so different. Sorry Ryan, but I have to disagree about going commando in board shorts. It’s just not comfortable. And I’m not going to be uncomfortable because I’m worried somewhat might think I’m lame. Guess what? I live in southern California, 4 blocks from the beach. My life is great, and I could not care less what someone else thinks. I agree with Tom. I need support especially when being active at the beach or behind a boat. Commando is uncomfortable. Being with your balls wet because you’re wearing underwear is too, and it is cold. Lol – millions of women wear racer back tanks with bra straps hanging out and no one cares, why should they care about a pair of underwear showing… You might also choose to wear a spandex rash guard to protect those of us who don’t need to see your junk while you’re in the reclining position. My only complaint is with light or solid colored board shorts that are so thin and revealing that you can tell whether a guy is circumcised. Going commando is the only way to go for me but I’ll wear jammers underneath boardies if the risk of me going into the water is only what it normally is as a lifeguard at a pool and will therefore most likely be dry at the end of the day. I guess if I worked at Bondi it’d be a different story. As a woman I hate it when guys show all when they don’t wear something under their board shorts. Those new board short liners at Original Watermen or jammers would solve your problem. Audrey it appears that you are being ignored (looks that way) listen up boys….always listen to the females and heed their advice!! The best board shorts I’ve ever owned! Summer is the best time of the year, and you have to be comfortable in what you are wearing! It is good to be better informed about the rules of board shorts. It is good to know that one should not buy board shorts with elastic waist bands. It would not be good for them to slip off in a climactic moment. Something else to consider would be to find desired shorts for a price within your budget. good to know about summer..!!? Is it okay to wear hybrid shorts when the sun goes down?